Charlotte C. Shanahan, age 88, passed away on Thursday, April 11, 2019, at UW Hospital in Madison surrounded by her family. She was born on September 17, 1930, in Dubuque, Iowa, the daughter of Dr. Julian and Anne Nemmers. She married John Shanahan on December 27, 1950 in Dubuque.Charlotte attended the Visitation and Clarke College. She was a teacher's aide and managed the Learning Center at Holy Ghost School. In retirement, Charlotte volunteered at the Finley Hospital and the Arboretum. Charlotte was a devoted mother and enthusiastic grandmother. She enjoyed family gatherings, traveling, cooking, and baking. 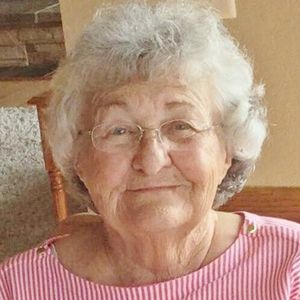 She loved playing board games, cards, and dominos with friends and family. We will dearly miss her love, wit, and giggles. She is survived by her children: Cathy (David) Baron of Libertyville, Illinois; Tom (Cheri) of Stevensville, Montana; Bill (Jeanne) of Cumberland, Wisconsin; Mike (Lilly) of Zurich, Switzerland; and Jon (Mary) of Sun Prairie, Wisconsin. She is further survived by 14 grandchildren, 7 great grandchildren, brothers Dr. Julian Nemmers, Fr. Mark Nemmers, Dr. David Nemmers, sister Betty Kasel, and many nieces and nephews. She is preceded in death by her parents, husband John in 2005, granddaughter Maggie-Lane, and sister, Virginia.The family would like to thank the UW Hospital staff for their care and compassion. A Mass of Christian Burial will be held at 10:00 a.m. on Tuesday, April 16, 2019, at St. Albert the Great Catholic Church, 2420 St. Albert Drive in Sun Prairie, with Monsignor Donn J. Heiar presiding. Visitation will be held from 9:00 am until the time of Mass. Burial will take place at Mt. Calvary Cemetery at 1:30 p.m. on Tuesday, April 16 in Dubuque, Iowa. In lieu of flowers, memorials may be directed to Holy Ghost Parish in Dubuque or St. Albert the Great Catholic Church. The beautiful and interactive Eternal Tribute tells Charlotte's life story the way it deserves to be told in words, pictures and video. I only knew Charlotte for a short time here at NPSL, but in that short time I really enjoyed talking with her. She was such a cheerful person to all around her, and she will be missed. My condolences to her family.